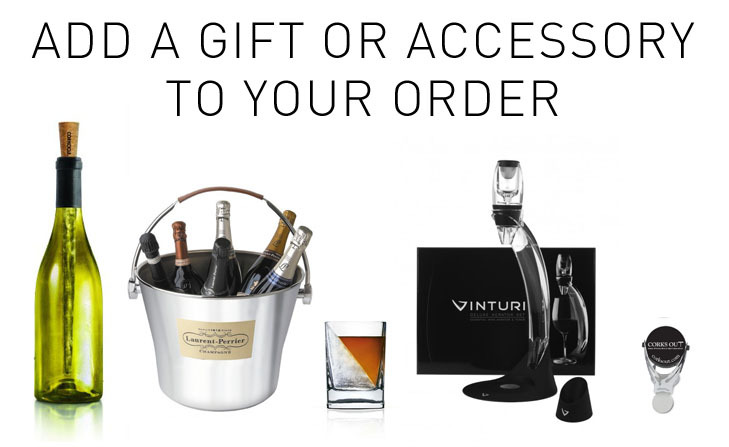 Corks Out stocks an extensive range of wine gifts from bespoke inexpensive gifts to branded extraordinary gifts, there’s something to suit all budgets. Our gift packs are extremely popular at Christmas time, Valentine’s Day and the perfect birthday present. We have something to suit every style and taste with gifts for him and for her. When you buy at gift with us you can have it delivered to yourself so you can hand deliver, alternatively, you can choose to have it delivered to them. We do not include invoices in any of our deliveries so what you spend will be kept top secret and you have the option to add a quality gift note at the checkout. Gifts for him- If it’s a Christmas wine gift or maybe a ‘thank you’ we will have the ideal gift for him. We stock many red wine gifts and whisky packs which include branded glasses giving it that extra special touch. Gifts for her- What do you buy the woman has everything? Wine & Champagne of course, if you want to supersize your gift we have great champagne and glass gift packs. Wine in a gift box- Our readymade gift packs include 1- 3 bottles of wine all presented in one of our quality wooden boxes. Slip a gift note inside to give it that extra special touch. Wine accessories and gadgets- If you know a self-confessed wine snob then buy them something with a touch of difference. Our wine Aerators are very popular as are the wine Corkcicle - a cooling corkscrew. Free delivery is given on eligible orders, check out our delivery page for more details we also offer fast reliable delivery with a 1 hour time slot, so you’ll never miss a parcel again. Do they always go back to a specific bottle? If you want to treat someone to their favourite wine, Corks Out has single bottles available in gift boxes, including the iconic Chateau Musar and classic Cloudy Bay Sauvignon Blanc. Do they like trying something new? You can treat them to a case containing 6 or 12 different wines so they have a chance to try a range of different wines. You can either play it safe with one of our easy drinking cases or opt for the popular mixed case put together by the Corks Out wine expert Ruth Yates. Are they a fan of a specific region or grape variety? Use their wine preferences to select a quality bottle that is perfectly tailored to their tastes. For example, if they enjoy full bodied reds, we have a great selection of wine gifts available from the intense Antinori Tignanello to the very special La Rioja Alta 890 Gran Reserva 1995. Is it a celebratory occasion? Corks Out also has Champagne gifts from iconic houses such as Laurent Perrier, Bollinger and Billecart Salmon. Champagne is a classic celebratory drink and guaranteed to go down a real treat, giving your loved one an opportunity to raise a glass in style. Are they a fan of spirits? We have a wide choice of spirit gifts ranging from popular tipples such as Chambord to luxury bottles including Hine Antique XO Cognac and Dalmore whiskey. You can also find some unique and unusual brands, perfect for those who like to be surprised to something a little different. Of course, if nothing from our gift selection takes your fancy, you can simply choose something from our range and we will pop it in one of our luxury gift boxes. Don't forget, we can also add a personalised message, making your present all the more special.